NEW! 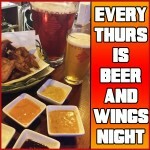 EVERY THURSDAY IS BEER N WINGS NIGHT! New for Thursdays at On Tap…Beer n Wings Night!! Our $100NT offer for 10 x Chicken Wings have long been a Thursday favourite, but now we’re combining the offer with pitchers of locally-brewed Redpoint beer! 3-Pint Pitchers of Long Dong Lager ($420NT), Tai.P.A ($540NT) & Rock Monkey Stout ($570NT) are on Happy Hour all night!